Relativity, the world’s first autonomous rocket factory and launch services leader, today announced a contract with Telesat, the renowned global satellite operator, that allows Relativity to play a role in Telesat’s innovative LEO satellite constellation. Telesat will now have access to faster, more frequent and more flexible launches at the lowest cost using Relativity’s Terran 1, the world’s first fully 3D printed rocket designed and built using Relativity’s groundbreaking proprietary 3D printing technology platform. This is the first time Telesat, or any major global satellite operator, has selected a completely venture-backed aerospace startup for launch services. This contract further solidifies Relativity’s leadership in the emerging NewSpace launch services market. With its reinvention of the rocket-building process, Relativity is positioned to become a valued launch partner for Telesat’s LEO program. Traditional aerospace manufacturing relies on fixed tooling, a complex supply chain, and extensive human labor. Traditional rockets are comprised of more than 100,000 parts, resulting in expensive, complex rockets that take 18 months or more to build and launch. Relativity is building the first and only aerospace platform to integrate machine learning, software, and robotics with metal 3D printing technology to optimize every aspect of the rocket manufacturing process, disrupting 60 years of aerospace technology. The company’s Terran 1 rocket is built from raw material to launch-ready in less than 60 days, and has 100 times fewer parts than traditional rockets. Terran 1’s unique architecture can be rapidly changed and scaled as satellite companies develop new capabilities. Relativity is on track to conduct its first orbital test launch at the end of 2020, and continues to grow a customer manifest of leading global satellite operators, commercial companies, and government payloads. The company recently became the first venture-backed company to secure a launch site Right of Entry at Cape Canaveral LC-16 from the U.S. Air Force, adding to its portfolio of major government partnerships including a 20-year exclusive-use CSLA agreement at the NASA Stennis Space Center E4 test complex, and membership on the National Space Council advising The White House. The company is expanding its infrastructure this year with a fourfold expansion to over 350,000 square feet of operations, production, testing, and launch facilities, including securing a polar orbit capable launch site. Relativity is the first autonomous rocket factory and launch services leader for satellite constellations. The company’s vision is to build the future of humanity in space--starting with rockets. 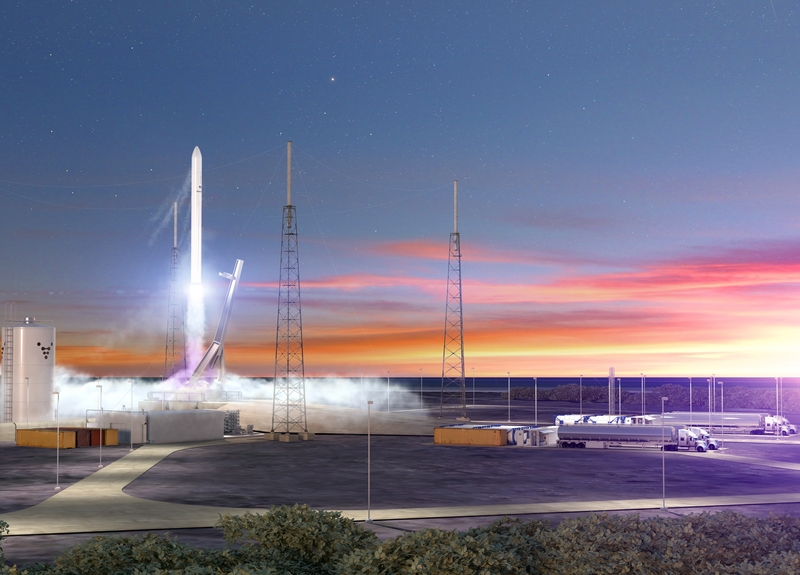 Relativity’s platform vertically integrates intelligent robotics and 3D autonomous manufacturing technology to build the world’s first entirely 3D printed rocket, Terran 1. Terran 1 has 100x lower part count than traditional rockets, a radically simple supply chain, and is built from raw material to flight in less than 60 days with unparalleled iteration speed. Relativity deploys and resupplies satellite constellations with industry-defining lead time, flexibility, and cost, better connecting and securing our planet. Relativity is backed by leading investors including Playground Global, Y Combinator, Social Capital, Phillip Spector formerly of Intelsat, and Mark Cuban. For more information, please visit https://www.relativityspace.com/. Telesat’s LEO constellation will leverage the company’s global, priority spectrum rights in Ka-band and patent-pending LEO architecture to transform global communications. It will offer a combination of capacity, speed, security, resiliency and affordability with ultra-low latency that is equal to, or better than, the most advanced terrestrial networks. Able to serve the entire globe, Telesat LEO will help satisfy many of the world’s most challenging communications requirements. It will bridge the digital divide with fiber-like high speed services into rural and remote communities, accelerate 5G expansion and set new levels of performance for commercial and government broadband connectivity on land and in key maritime and aeronautical markets, which are among the fastest growing in today’s satcom industry. Privately held, Telesat’s principal shareholders are Canada’s Public Sector Pension Investment Board and Loral Space & Communications Inc. (NASDAQ: LORL).